Starting kindergarten, school (or returning after a break) can be nerve wracking for children and parents alike. Personality, temperament and developmental age all play a part in how well children cope, adapt and adjust. While I have tips below to help, want to know what your child needs more than anything to get off to a great start? There’s no harder job with more blurred boundaries, over time, expectations and mental load than raising, supporting, loving and organising your children and family. No matter how exhausted and overwhelmed you feel, this doesn’t mean you don’t know what you’re doing. Remember that. There’s a tonne of information out there to help, but its only helpful, if it helps. If it drags you down, confuses you or feels impossible, then it’s not for you. It might never be for you – or it might be for you at another time. Don’t feel bad, your children need your authenticity and healthy wellbeing above everything. Your personality, history, experience and intuition has all the guiding principles for being the parent your child wants and needs. One more time because it’s so important…Parenting can be the hardest, most time consuming and constant job OF YOUR LIFE! Give yourself a break, take a breath and everything gets easier over time. 1. Transitions, changes and anything new will bring out a variety of feelings in you and your children. Let your children have their feelings without judgement about whether or not they should feel that way. Most children experience mixed feelings about starting kindergarten and school. When their feelings are acknowledged they get better over time at handling their feelings responsibly. If they are nervous, acknowledge it. Hear them out. Understanding comments like, ‘It’s only natural you feel that way,’ and ‘other children get that feeling too,’ helps them relax, normalise and accept the feelings so they don’t feel broken, or weak, or hopeless. Social emotional growth then follows. 2. Start a goodbye ritual before starting kindergarten / school to keep farewells consistent and familiar. The ritual might be a special hug, handshake or saying that signals, ‘bye for now!’ Predictability reduces anxiety. 3. Be prepared for separation anxiety. Sometimes it’s there from the start, at other times it surprises you down the track when it hits your little one that kindy/ school isn’t just for a few days. It’s normal for young children to want to stay close to the people they love. You’re their secure base, the person who makes everything better, the one whose been there through thick and thin right from the start. When they are sad about separating, acknowledge this tough feeling. Name their feelings and empathise with comments like, ‘you’re sad, you want me to stay. I understand.’ The more you respond in an empathetic way, the sooner they’ll move through this feeling. Try not to rush it or hide your own anxiety by slowing your breathing and trying to stay in the present. Next, draw your child’s attention to the next point of connection. Just like friends often say, ‘let’s catch up soon’ children are comforted by knowing they’ll see you again soon too. Comments like, ‘I can’t wait to hear all about your day when we go bike riding tonight’ and ‘I’ll be waiting by the rock ready to play eye spy,’ help them see ahead to the next time you’re together. This can be calming and reassuring. 4. Encourage independence at kindy / school drop off. Let them carry their bags and unpack their belongings. If they don’t know what to do ask questions like, ‘where could we find out the answer?’ Or help them ask a teacher/ another student for help. These self help skills are vital for developing independence and feeling connected to their kindy/ school. If you do too much for them, they can feel helpless and dependent, seeing you as the only person who can help them. This effects how well they participate in their new environment. 5. Try and be punctual. This is never easy, no matter how prepared you are. Children are unpredictable and any small thing can set you back. Consider waking up earlier than your children and maybe wake them up early too. If you’re always fifteen minutes late then you might need to wake up fifteen minutes earlier. Focusing on punctuality is an important life skill and manner. It tells the teacher and the class, ‘you’re important and so is your time.’ Keeping people waiting says, ‘other things mattered more.’ Help your child understand why punctuality is important and ask them if they have any ideas about how to get to kindy/ school on time. Try ideas out until you get closer to your goal while helping them build self awareness about what distracts and slows them down. 6. Make a visual schedule/ checklist of what to do to be ready for school. You can laminate picture cards for all the necessary steps (brush teeth, uniform on, readers in bag, shoes, pack lunch, breakfast, hair and so on). You can place each step on a Velcro dot and when each step is completed they can pull it off and ‘post’ in an envelope below. The beauty of these schedules is they not only build independence but the schedule becomes the ‘boss’ rather than you. When your child is floating around aimlessly you can ask, ‘what’s next on your checklist’ rather than dishing out another instruction they probably won’t listen to! You can also make these with a whiteboard where they tick everything off. 7. If they are upset after school about a friend/ teacher, listen but don’t jump in too quick. When children are young they tend to globalise and magnify negative events. They might say, ‘everyone at my school is mean’ or, ‘I have the worst teacher in the world.’ While it’s important to hear them out, acknowledge their feelings and keep an eye on things, try not to get involved or add your own thoughts and feelings too soon. This can make things much worse in the long run. If they keep repeating a problem or are anxious about going to school make a time to talk to their teacher to see if you can find out more. 8. Allow natural consequences. Try to support them through rather than fix their challenges. Don’t jump in to drop a forgotten hat so they don’t miss out on lunch play. If they forget their hat, they need to experience the consequences which usually means play in the shade. If you rescue them from challenges like this, they can develop a sense of entitlement that isn’t reasonable and and can miss opportunities to build coping skills when things don’t go as planned. 9. Offer a transitional object in their bag if they find separation hard. A piece of your jewellery/ clothing/ a photo/ a special crystal ‘full of Mummy / Daddy’s/ Caregiver’s love’ are all examples of an object connecting you to them when separating. 10. Casually talk about school routines and rules ahead of time so there are fewer surprises. Some children don’t know you need permission to go to the toilet during class…or that teachers get unhappy if you talk / muck around during learning time. Guide them to respect their teacher and their rules which are usually designed to keep everyone safe and free to learn. 11. If you’re not happy with the teacher/ school don’t openly discuss this with your child. Your lost confidence in anyone or the school will almost certainly mean their lost confidence, and potentially the start of stress and anxiety around schooling. Remember to give it time. Starting kindy and school means getting to know lots of new adults. Few of them will bring the same sense of comfort and joy as a parent or other familiar adults. Most children take some time to adjust to and accept their new teachers. Help them through by reminding them they don’t need to like their teacher immediately but do your best to build a healthy relationship with their teacher so they see your confidence in them. 12. Family calendars help everyone knows what’s happening each day. Library days, sports practice, special events, who will do pick up / drop off can all be recorded here to keep everything predictable and organised. Finally, as always, follow your own intuition about what your child needs, to feel confident and prepared. These tips aren’t written to be prescriptive, they offer a framework to build your own approach from. Wishing you all the very best for the first day back at kindergarten and school, whether you’re oldies or newbies! 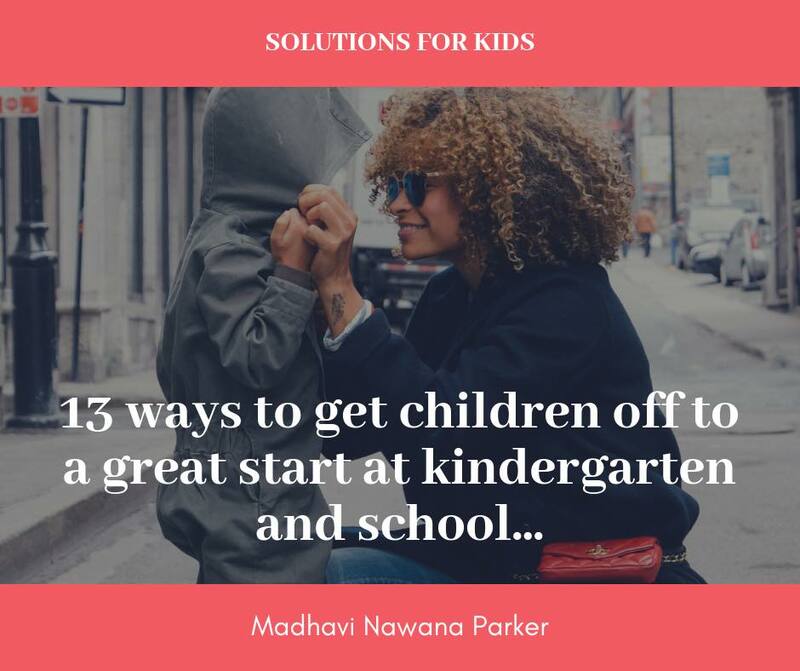 Madhavi Nawana Parker is an Author, Keynote and Public speaker and mother of three.